Hey all! I just wanted to let you know that the pattern for my quilt Adorela (formerly known as The Orla) is now available for download on the Robert Kaufman site. This was designed using Kona solids and all of the amounts and color names are listed in the pattern. It also is compatible with the Accuquilt 7″ Drunkard’s Path Die for easy cutting (though templates are also provided!). 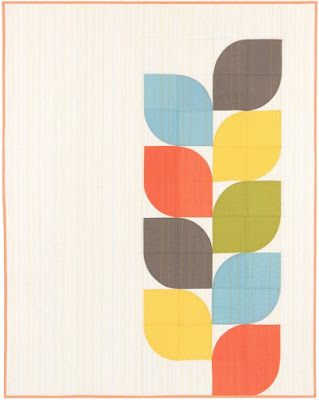 The finished quilt measures 50″ x 60″ and is my homage to the amazing designs of the epic Orla Kiely. This is a great block that makes use of my technique of one pin curved sewing and trimming for disappearing seams. I explore both of these techniques at length in my book, A Quilter’s Mixology and my DVD on Curved Piecing…so for more tips check out those resources. So go check out the pattern at Robert Kaufman and make one of your own today! Who doesn’t love a free pattern?! Very excited about this pattern, so glad you're sharing it. I recently did my first curved piecing and it didn't go terribly but it also didn't go well. I think the size of these curves in your pattern will make it easier for me to practice. Plus that leafy/squircle shape is one of my favorite shapes! Could you put a link to the Robert Kaufman site as I'm not able to find it? Great looking pattern but then I'm a fan of yours already. Thanks. Hi Karen, the top picture is linked to the Robert Kaufman site…just click on it and it will take you there. And there is also a hyper link at the bottom of the post under the bolded "Go check out the pattern at Robert Kaufman" as well. I don't know which version I like better! Thanks for the patten and the generous way you share your talent. Wow, love this! Thank you for sharing your gorgeous work. You are so welcome!! I'm glad that you like it. I hope to see many versions of this out there! i love that navy scrappy backing Angela. thanks for the link! Ooooh, I love Both versions!! I didn't realize how large the scale was; wow!! Hey Angela, could you share where you ordered the plastic templates? I am not finding it easy to find a vendor that understands what I am looking for and I'd like to be able to order some plastic templates. :o) Thanks! Thanks! I picked up your book, A Quilter’s Mixology, over the winter while away after seeing it in the library. It’s beside me now as I go through it cover to cover to select my first project. I hope you’re having a good day today. Sorry to learn you are being challenged with health issues. I just purchased your book the other day and I love it. I am inspired and can’t wait to make some of the great quilts you have designed.